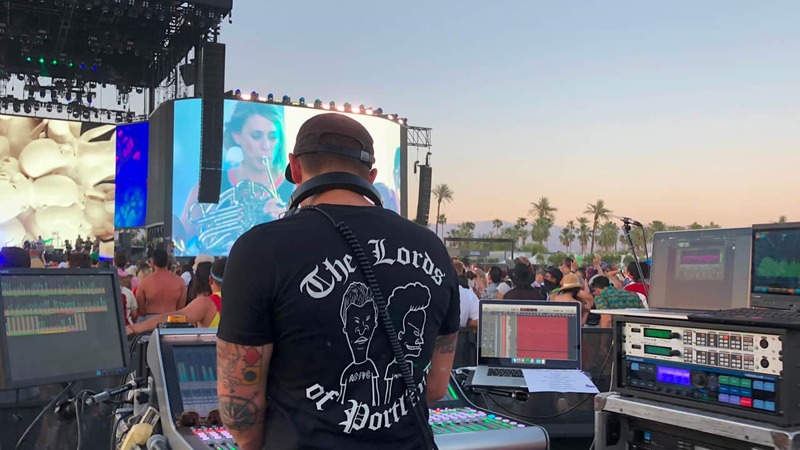 At the heart of Coachella Valley Music & Arts Festival stand the top live mixing engineers who sculpt the event’s spectacular sound. We talked to some of the world’s best to find out how Waves Live tools power their mixes. Happening each spring in sunny Indio, California, the annual Coachella festival is one of the largest, most high-profile music events in the U.S., boasting some of the world’s biggest music artists alongside emerging star acts. Coachella 2018, which took place during two consecutive weekends in 2018, featured a staggering lineup of hip hop, rock, indie and electronic dance acts between numerous stages. As we roamed the festival grounds and visited the different front-of-house operations, we found Waves tools being used to power the sound of diverse performers. 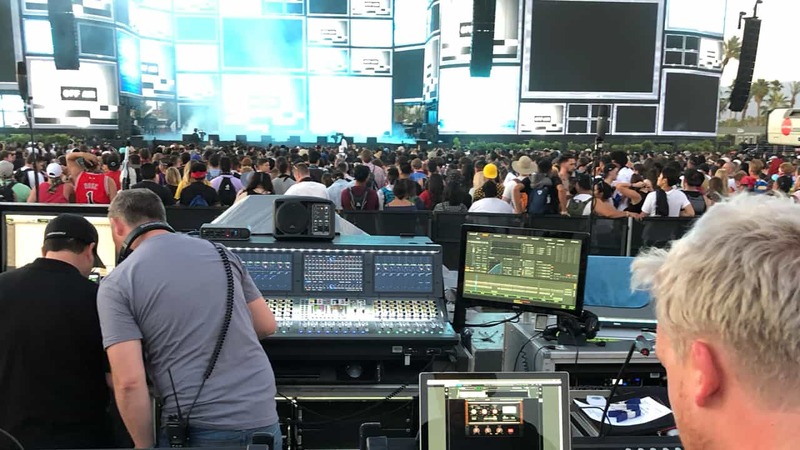 Their live engineers were running Waves plugins on diverse setups and consoles – everything from Avid VENUE S6L (Kygo) and Avid VENUE Profile (The Weeknd), to DiGiCo SD10’s (David Byrne, Vince Staples), to SSL Live (Portugal. The Man) and Waves’ own eMotion LV1 live mixer (MØ), and much else. We took advantage of this opportunity to talk with several prominent FOH engineers, peek under the hood of their productions, and find out which tools help them create a tight, spectacular-sounding show under demanding festival conditions. AOne of our first stops was rapper Vince Staples’ show. 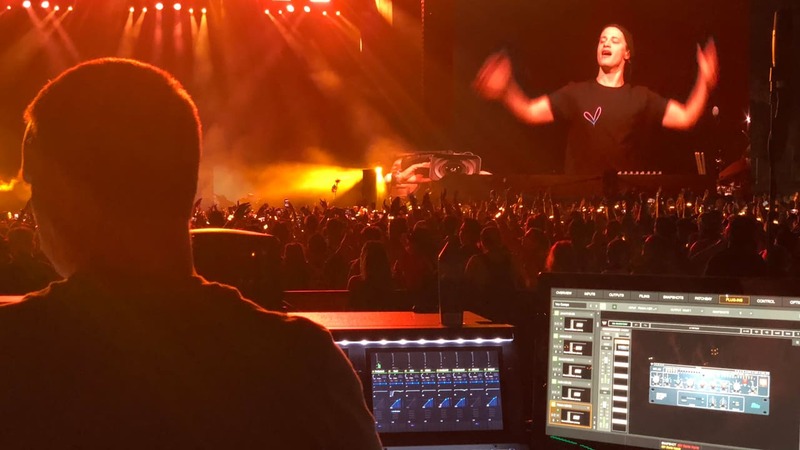 Staples’ FOH engineer, Robbie Barr, has been touring with DiGiCO SD-series consoles nonstop for five years, mixing such acts as M83, Foster the People and Banks. 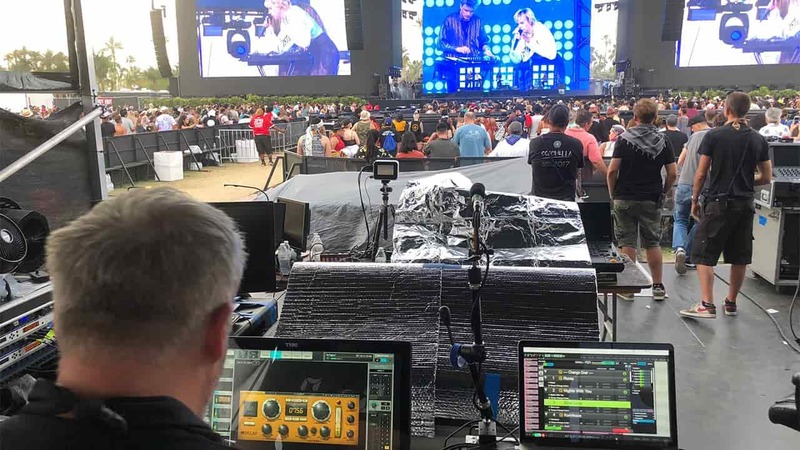 His setup for Staples at Coachella consisted of a DiGiCo SD10 console, two Waves SoundGrid Extreme Servers (one for redundancy), the Waves MultiRack plugin host software running on a Microsoft Surface Pro, Crane Song HEDD, and a Kush Audio Clariphonic. 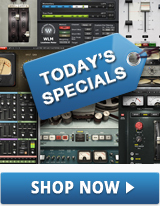 Which plugins are most essential for you? Which plugins have you been using with the Profile for this show? Front-of-house engineer Jon Schumann (Mew, The Ravonettes, Lykke Li) has been mixing Danish electropop artist/producer MØ’s live shows on Waves’ eMotion LV1 live mixer for well over a year now. “It’s a very simple system,” he says, “in which both myself and monitor engineer Jeppe Andersen are relying extensively on the eMotion LV1 software mixer and Waves SoundGrid technology. The LV1 is the backbone of our touring rig. We run it on a Mac minicomputer with two 20” touchscreen monitors, a DiGiGrid IOC interface for analog/AES ins and outs, a DiGiGrid MGO MADI-to-SoundGrid interface for stage connectivity, and a SoundGrid Extreme Server for plugin processing. We use the LV1 for monitors, too, with the monitor system connected through DiGiGrid MGO and MGB interfaces to our extensive MADI backbone. What’s the main draw of the eMotion LV1 system for you? “Two things – the sound quality is amazing, and the system is so flexible and light. I’ve managed to get my mixes to sound exactly how I want them, no matter if we’re playing a club or a huge festival like Coachella. And it’s so lightweight. We’re doing quite a few festivals this summer, and it’s great to be able to pack up our entire small creative ‘office,’ check into the airport, and put it all on the plane to fly with us wherever we go on tour. What plugins are you running on the LV1 at Coachella? Our next stop was with Eds John, whose credits include Orbital, Richard Ashcroft and Dave Clarke. 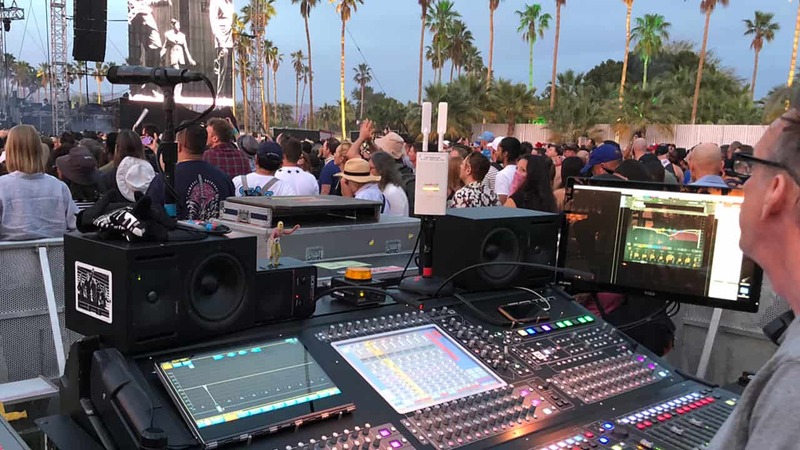 At Coachella 2018, he was helming the boards for popular Norwegian DJ/producer Kygo, using an Avid S6L-32D console, a Waves WSG HD card, two Waves Extreme Servers, and a d&b GSL speaker system. 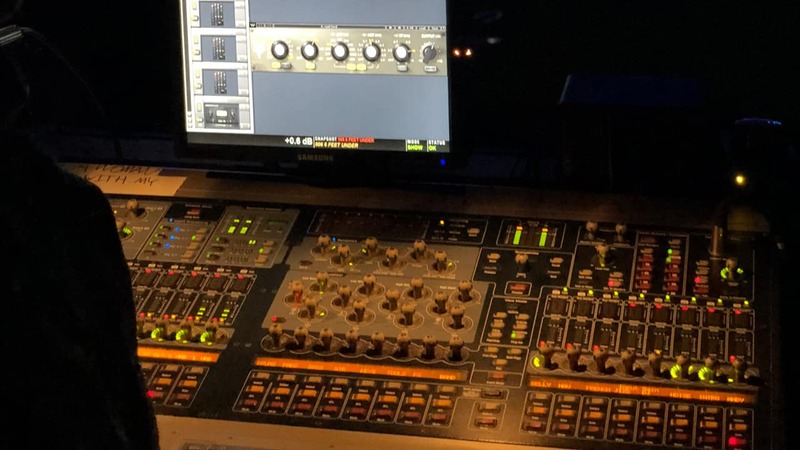 Last but certainly not least, we caught up with front-of-house engineer Pete Keppler who has mixed tours for music’s biggest icons, from David Bowie to ZZ Top. We asked him about his unconventional setup for legendary ex-Talking Heads frontman David Byrne’s live show at Coachella 2018. Read the full interview here. 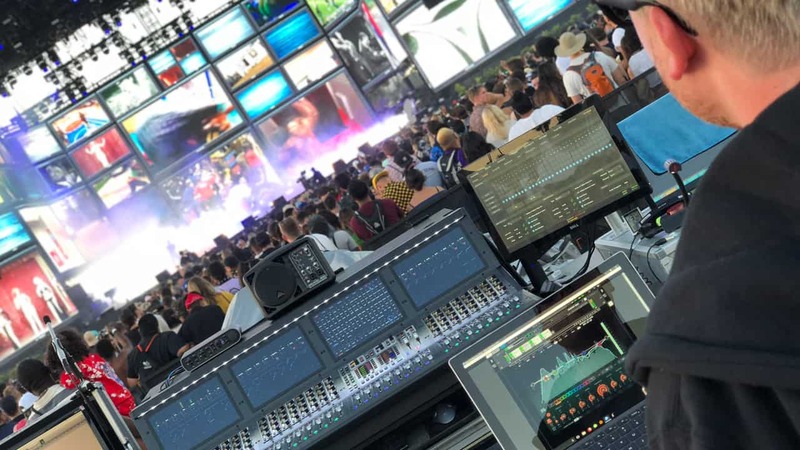 From hip hop to rock, R&B to EDM, we were happy to find so many live sound engineers relying on Waves tools in what is simply the coolest music festival around. For many of the artists and their engineers, it was the culmination of a lot of hard work – and we at Waves are extremely proud to have been part of it! Looking to enjoy the benefits of mixing live with plugins? Check out WavesLive solutions for live sound.